I had a boiler installed last fall. It didn't go as well as I had hoped, despite my best efforts and intentions to have it done right. Basically the installer kind of misrepresented to me that he had read and agreed with Dan's books, pumping away, etc. I was gone for a few days when they came to do the install, and my wife sent me pictures of the progress, which prompted many phone calls on my part. They ended up throwing the pump on the return, using too small an expansion tank, setting the system pressure to 22psi (cold - exactly 20 ft from basement floor to top of system), reversing the supply and return connections to the old gravity pipes, installing the exhaust and intake too close together, and failing to install a boiler bypass. Heckuva list, eh? In the end, they lowered the pressure, swapped the supply and returns, and called it a day. Long journey later, I did manage to recoup about 90% of the 'labor' costs and gave them many scathing reviews. We lived with the boiler as it was for the winter as shutting it down to repair was not an option. And honestly, it heated the house fine. But....nagging thoughts persist. We had our roof replaced last week. Before they started, I sealed the exhaust and intake pipes (this is a Burnham ESC4 nat gas boiler) to prevent all the dust and shingle bits from possible getting in there (sidewall terminations). I thought, Boy, I don't want to trap all this horribly humid air in the boiler. It's off for the summer. So I removed the inspection/air box cover so that it can stay dry (I run a dehumidifier in my basement ALL summer to keep the humidity around 45% -- was pretty swampy when we bought the place). I took my phone and took a few blind pictures up into the boiler sections. What I'm wondering is, does this look like it should after one 7 month heating season? Seems...excessive. But I'm no boiler expert, I'm a heavy equipment mechanic by trade. On the list for this summer are: re-packing all the hand valves on all the radiators (we have all cast iron rads), installing a proper size expansion tank, moving the circ (which is now a Bumblebee) to the supply after the PONPC, and installing a boiler bypass. 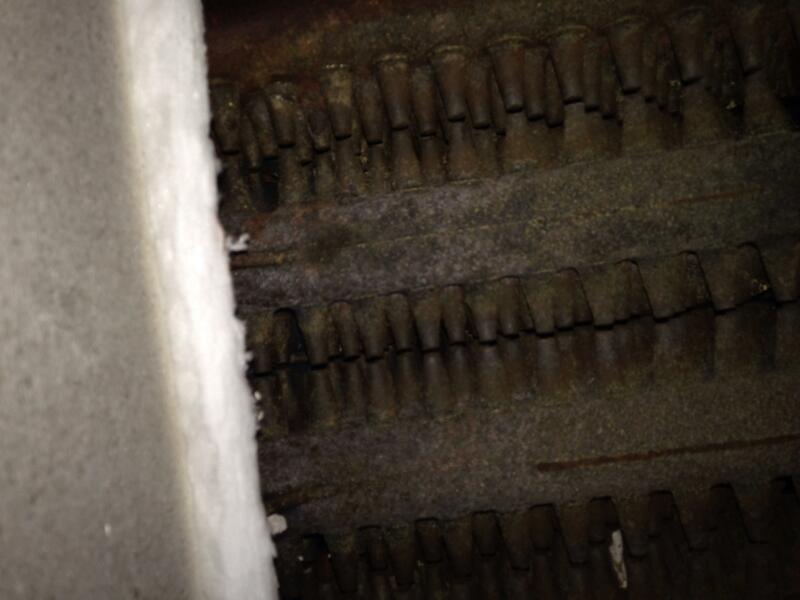 This is my concern...Is the rust/buildup indicative of condensing flue gasses? I know we run relatively low water temps. Maybe maxing out at 140* or so. The Burnham is rated to handle 110* return water...while it may get there eventually, I think it's condensing the whole way there. I'm just concerned, as I want this boiler to last as long as possible with as few problems as possible. Sorry for the long-winded post, and happy Sunday to everyone out there. 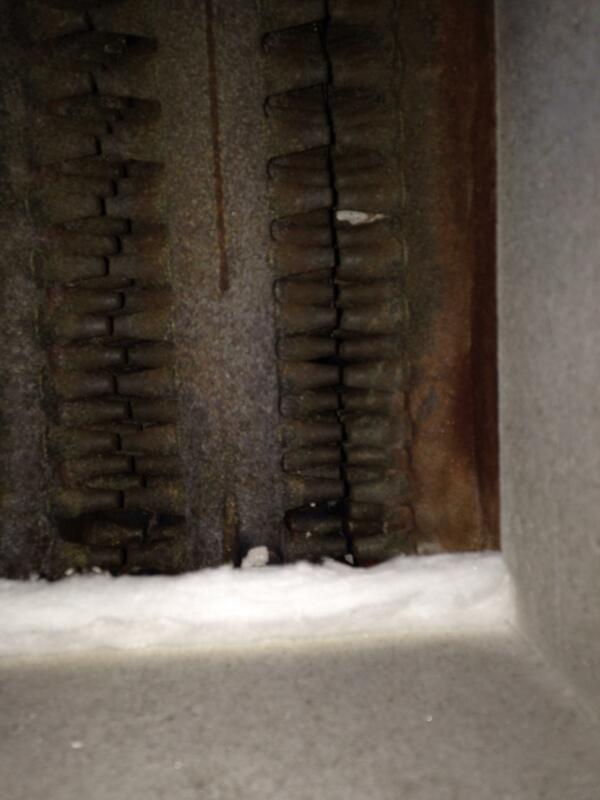 Ford Master Technician, "Tinkerer of Terror"
I don't see any problems, it looks like a clean CI block to me. I would just make sure and monitor your return water temps. I would not use 110 as my return as it will guarantee condensing. The heat loss of the house came out to 68000 btu/hr at a design temp of -17f. Which we see quite frequently around here. Also planned within the next 2 years are an indirect and a basement zone. For now, it's all one zone, currently first and second floors heated, third has electric baseboard that is unused, and basement just gets residual heat from piping and boiler. It gets chilly in the winter down there. Doing the math using the cycle counter and hour meter on board, I came up with an average cycle time of 21 minutes. Granted, this is without a boiler bypass as recommended by the manual. I played with the thermostat this last winter, trying 2 CPH and 3 CPH, and the 2 setting definitely gave it a longer burn time. I also have the board set to run a 4 minute post purge on the circ. I have yet to ever hear it short cycle, probably because the house and rads have enough mass to act as a very large flywheel. All original plaster and lath, good sized steel pipe, and large cast iron rads (the smallest of which, at 21 EDR, still weighs 200 pounds). Once the boiler cycles off, it may fire again a half hour later, or it could be 2 hours later. Really dependent on if the wind is hammering the east face of the house where the majority of the glass is. But going by my installed EDR, and average water temps last season, I'd say that on average the heat loss is more realistically around 40-50k at 10*f. Apparently the house is sealed/insulated a little better than I thought. We did hit -29*f AND 40 mph winds last winter (not counting wind chill), and I noticed that the boiler ran very long cycles, almost continuously. Those nights we had our highest average water temps of the season. Knowing what I know now, I would've stepped it down to an ESC3. The only reasons I stuck with the 4 were for added capacity later, and because I found that all the literature I found (on paper and online) was wrong on it's ratings. They listed it as a 105k input, 92k or so out (net), which I knew was way too much. But the actual rating on the nameplate is 91k input, 78k net, 68k DOE for the 4. So pretty close to design day needs. Overall I like the boiler, but in hindsight, I do wish I had nursed the old WM thru another winter and saved a little more towards a WM ECO or a Triangle Tube, since in my case the thing would be condensing all the time. Oh well, live and learn. But boy, I don't even want to imagine how badly they would've botched primary secondary piping. Eek. My main concern was if what I was seeing in their was indicative of condensation...but I think I'll be installing a bypass regardless, just to get the average boiler temp above 140*. That's what the manual shows, in any case. 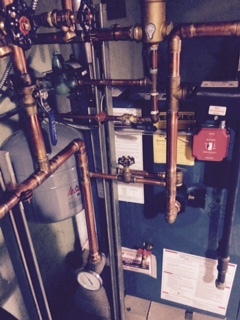 A boiler bypass, not a system bypass. So it must just give the boiler a smaller percentage of water to heat, therefore allowing it to heat it to a higher temp, before re entering the system? If it's in the book, it must be for a reason. Although, as my installer pointed out, there's an asterisk that says "optional". And nowhere on that page does it say why it's optional. He would've had to turn the page for that info. And hey, that's damned hard work! Sorry. Ranting a bit. I learned my lesson, and now that I'm on a first-name basis with our city's inspectors (I service their fleet vehicles), I intend to do the work myself in the future -- with the exception of gas pipe work. That's a liability I don't want or need. Thanks for the advice, and as I've said before, this is the best heating forum on the interweb! ---still looking for a residential steam system to explore around here, but we are predominately a hot water area. Steam systems are very interesting to me. 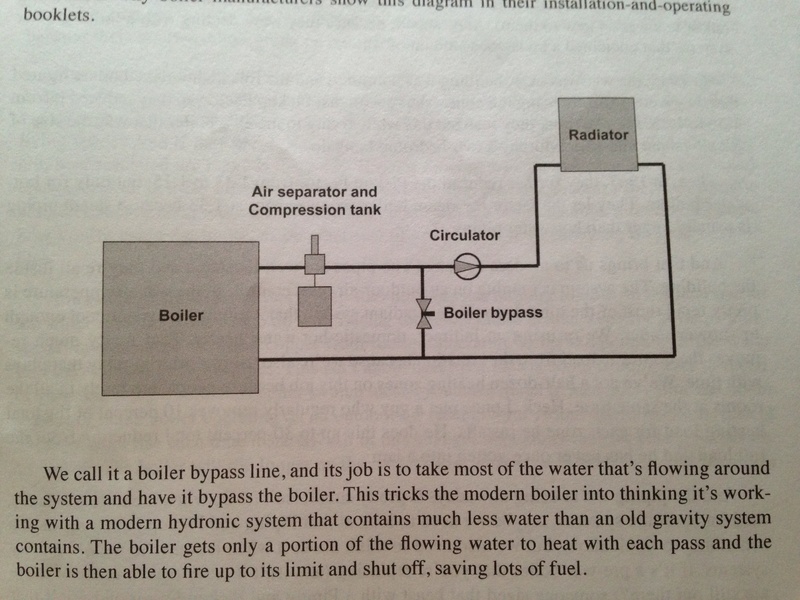 The diagram I have shows the bypass as a bridge between the return to the boiler and the supply out. So if that bypass valve is fully open, the boiler would in theory see zero flow, and the system would see full flow. Then they say to throttle the valve until the boiler maintains the minimum preferred temp, which will be higher than that of the system water. 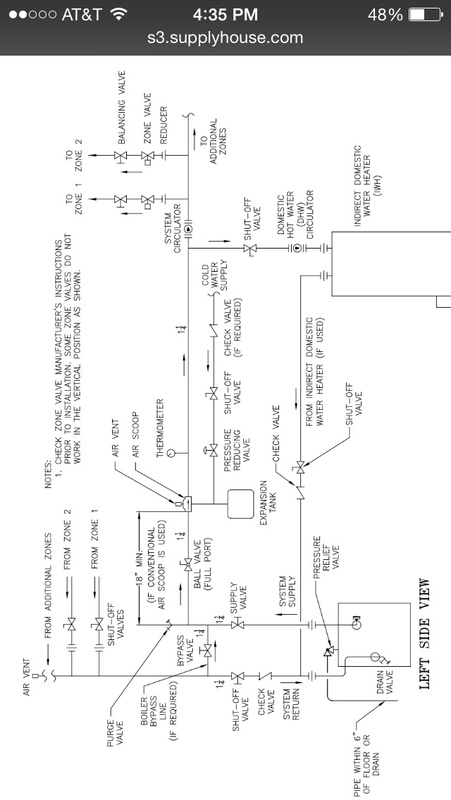 This is assuming that yes, the circ is upstream of all of that plumbing, as it is in the diagram. The way I understand it, this way the system will always see full flow (thus bypassing the boiler: boiler bypass). This allows the boiler to heat up to a higher average temp and reduce condensing. It doesn't increase return water temp. They say a low return temp is okay as long as A) flow is relatively low through the boiler, and the delta T thru the boiler is high enough to prevent condensing at that flow....so they spec this bypass. I've seen other boilers that spec a 'system bypass,' such as copper boilers and older Weil McLain boilers (though to be fair, the WM's show both types of bypasses as optional). The system bypass returns some hot supply water to the return to keep the return temp up to prevent condensing...thus bypassing the system by returning water directly to the boiler. Perhaps my terminology is backwards between 'system' and 'boiler' bypass, it's just the terminology I've gleaned from various conversations and Dan's 'Classic Hydronics' book. I think, all boiled down (with the DHW indirect removed), Burnham's diagram is hydraulically the same as this one in Dan's book... That's what I think I'm going to go for. IE, drop the flow through the boiler by about 10-15%, which (if my math is right) should allow the boiler to come up to 150* minimum instead of 130*. Of course since it'll be a ball valve, I'll be able to make adjustments. Also considering a Danfoss thermic valve if I can afford it. Here is how I do my bypass on ES2.I have temp gauge on return of boiler to tell me how much to throttle bypass valve.Seems to work. Jonny - that's basically what I had in mind...are you 'pumping away' from the expansion tank on that setup (meaning, is the circ on the supply after the bypass)? Yes always pump away.On that system there was a lot of CI radiation and I also used outdoor reset.I get your point about the bypass causing excessive cycling and agree but in this case everything ran well as boiler was sized properly .Concern was more about flue condensation than boiler protection as they are claiming it can handle low temp.I have seen many installed without bypass so I guess it really is up to installer and if he/she is getting a proper price for installation. What if stack temp doesn't climb eg running on odr.I honestly do not know what the S/S manufacturer will guarantee but I was advised to do this by someone I respect for that reason.It's impossible to get a clear answer so I just do it. Heh. That is a very good question. My total flue consists of 36" up, 90*, then 48" out, followed by the USBoiler provided vent termination. Granted, my ESC is an induced draft and the ES is not, but I wondered that myself. My vent piping is all stainless Z-Vent. I was possibly more concerned with condensation occurring within the boiler itself...and maybe (hopefully) that's an idiotic thought? If so, then I guess a bypass is altogether pointless in my situation. Looking at the vent pipe now, there is some very slight staining near the o-ring bosses where liquid would pool, but nothing I would consider bad. Looks like water spots. Jonny - that's what I figured on that setup, and that's what I'm aiming for myself. Of course I'll have to move and rewire the circ, but that's no big deal. Mass is something I have no shortage of in terms of radiators. All of mine are large, freestanding cast iron, total of 436 EDR in the house. Which is nothing compared to my mother's house, an original 1890's home across town. She has 11 rads with a total of 950 EDR or so. She's thinking about selling and sadly doesn't want to 'burden' me with such an old (but very well-kept) house. The original gravity monster boiler was there until I was in my late teens, so I remember it well. 6" screwed pipe in that basement, and a lot of 4" as well. You are exactly right about that. Tweak one thing and all others change. 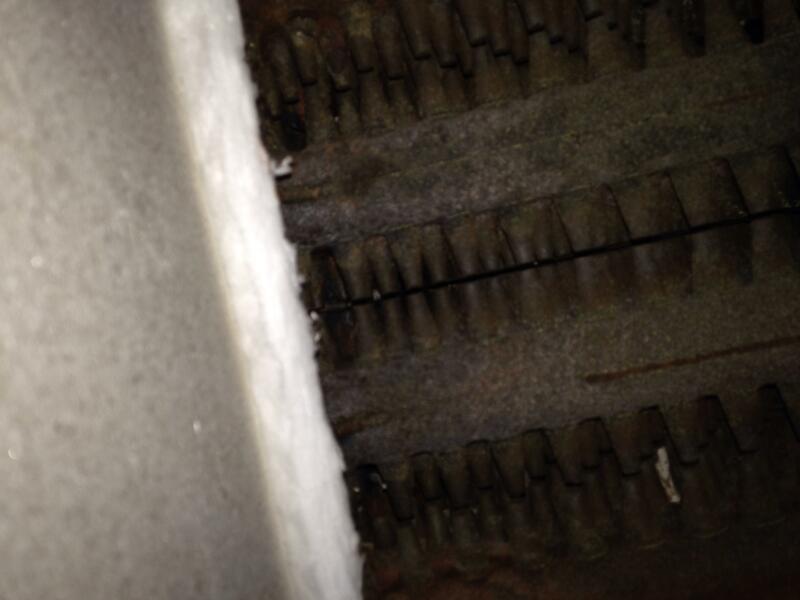 I learned that after the boiler was installed and I put in a delta T ECM circ... Suddenly the radiator in my daughters' room wouldn't heat. I had to loosen the packing nut and turn the valve considerably. It always heated fine with the 'monster' circ the previous boiler had. Shoulder seasons are tough. The boiler doesn't short cycle, per se, but it'll only fire for about 15 minutes out of every 1-2 hours or so. Outside temp of 50, supply water temp of around 90. Heh. We have good southern exposure so as long as it's sunny and above 45, the heat stays off all day. Then I'll usually turn the stat up 2-3* around sunset, let it satisfy, and it'll be off til the middle of the night. I like to tinker, but at this point in my life I have a lot more time than money. So data recording was my hobby over the last few winters. This last winter wasn't nearly as bad as 2013-14, but on a therm/HDD basis, this boiler is definitely better than the 30 year old WM VHE we had. Plus this one doesn't leak when the water temp goes over 120*. I was raised in that old drafty house, which never had the stat turned above 62. Here we average 68 when the house is full (evenings and weekends), otherwise about 65. I tried varying amounts of setback, and found that for the most part, a constant temp is best, even in our smaller home.